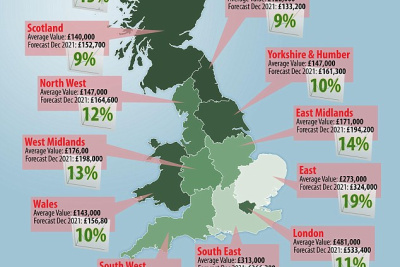 Where Will House Prices Rise The Most Over Five Years? House prices will rise by more than £50,000 in some areas over the next five years, but that growth depends on how Brexit negotiations turn out. The typical value of a home across the country will rise 13 per cent by the end of 2021, up from £214,000 to £241,900, according to Savills - a £27,000 rise in five years.